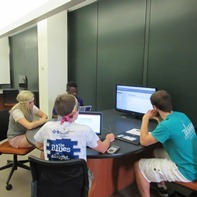 Six collaborative workstations are located on the west side of the 1st floor, just north of the Research & Instruction Office. Each station features a large central display with screen sharing capabilities for up to four devices. Lounge seating and group tables are also located in the area, along with mobile whiteboards.